The answer to this question is still unclear. Most forms of laser treatment have only provided the industry with small, poor-quality studies involving a small sample groups of patients with lighter cases of nail fungus, some of whom appeared to experience improvement after the treatment. And while most studies have reported no adverse effects, the system zaps the nail fungus with very high heat, which in theory could damage healthy tissue around the toenail. In addition, many treatments can often cost up to or over $1,000 and most medical insurances do not cover these costs. And perhaps most disappointing is the fact that the majority of patients who tested and saw positive results from laser treatment had to return for additional treatments within 4-6 months. The idea of the “one-stop-shop” solution is evidently not the case. Dermatophytes are fungi that can cause infections of the skin, hair, and nails due to their ability to utilize keratin. Once detected, it is critical to start using a toenail fungus treatment in order to minimize the severity of any infection. The organisms colonize the keratin tissues and inflammation is caused by host response to metabolic by-products. These infections are known as ringworm or tinea, in association with the infected body part. Occasionally the organisms do invade the subcutaneous tissues, resulting in kerion development. The organisms are transmitted by either direct contact with infected host (human or animal) or by direct or indirect contact with infected exfoliated skin or hair in combs, hair brushes, clothing, furniture, theatre seats, caps, bed linens, towels, hotel rugs, and locker room floors. Should I Remove Infected Nails? 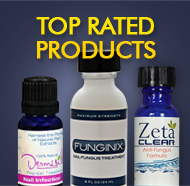 This is another tactic in the elimination of nail fungus infections that medical professionals are still unsure about. However, let’s point out a few general facts regarding nail fungus cases and whether it’s possible that removing a nail is a real way to cure toenail fungus. How to know which treatment to use often depends on the stage of the infection and other factors. If there is only a white patch on the nail, a strong, effective topical nail fungus treatment should cure the infection. If there is nail thickening, brittleness, separation and inflammation, topical solutions are still effective but there may need to be an oral supplement of some kind to increase the medicinal dosage. The usual discoloration of the toenail is a yellowish brown hue. If there are other organisms causing the change in the toenail, the discoloration may take on a dark green to black appearance. Black toenail can also be caused by trauma, autoimmune disorders, and melanoma. If the infected nail is in this advanced condition, it is very important to consult a medical professional to determine the proper course of action. It is obviously very important to arrive at the right diagnosis before treatment or sufferers will simply be wasting their time and money.